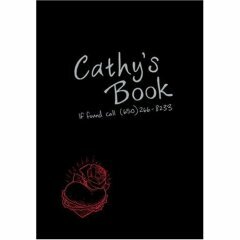 Set up as the diary of Cathy, a 17 year old girl with an unhealthy curiosity about what her 23 year-old boyfriend is up to, this book tells the story of drugs, intrigue, and the Chinese mafia in San Francisco. The story however, is quickly dwarfed by all of the other elements to this package -- a half dozen real phone numbers (yes, you can call them!) and a bunch of web sites to research. Combined with copious illustrations throughout and a packet of 32 slips of paper (my library catalogued each of them!) that amplify and illuminate the story. I found all the trappings a bit gimmicky and focused on the story, which was a bit convoluted and thin. However, if you like a mystery and want to have an unusual experience, then this is a book to digest. Some reviewers have compared it to an RPG and I can see how it would have a similar appeal. But I think the target audience is actually a bit younger. I could easily see a pair of seventh-graders having a blast researching every angle of the story and comparing notes. A lot of fun and hours of entertainment. As a read, however, this was not so exciting.